ATTLEBORO, Mass. 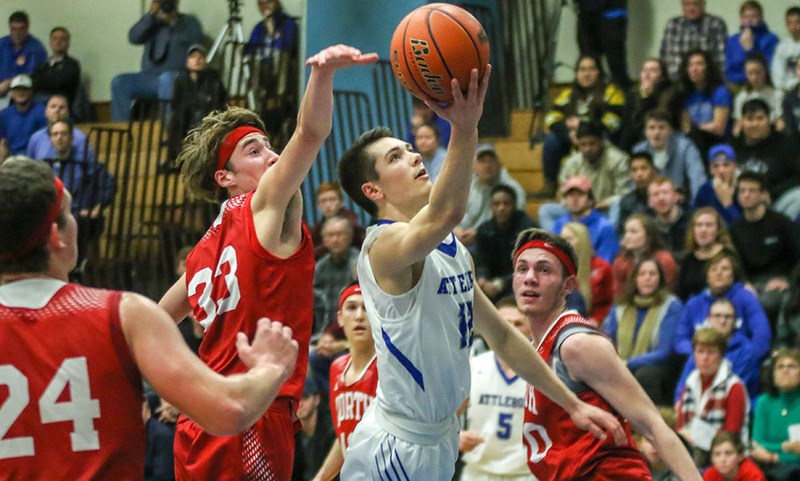 – Throughout the first 10 minutes of Tuesday night’s rivalry showdown, Attleboro and North Attleboro went back and forth trying to grab hold of the momentum. With five minutes left in the second quarter in a one-point game, Attleboro turned it up a notch — on both ends of the floor — and orchestrated a 14-0 run to finish the first half and build a double-digit lead it never relinquished the rest of the way en route to a 68-50 win over the visiting Rocketeers. North Attleboro hit four shots in the opening four minutes, including a pair of three-pointers, to build a 10-6 lead. 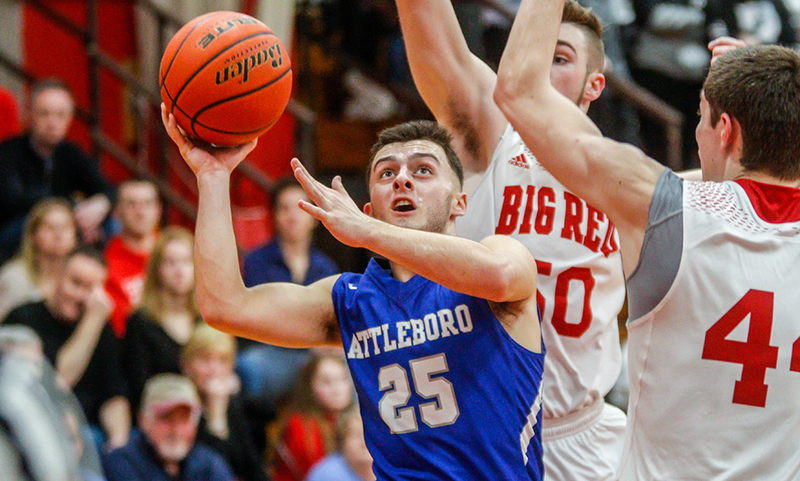 Attleboro responded on the back of junior guard Bryant Ciccio, who scored 12 of his game-high 21 points in the opening frame, to take a 19-13 lead after one. The Rocketeers got the momentum back on their side with a 7-2 spurt to open the second quarter. 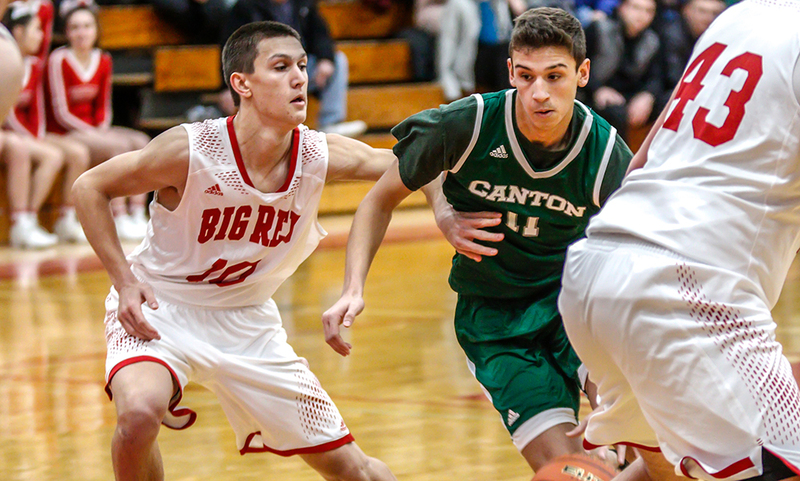 Ethan Friberg (10 points) scored down low, and Josh Montague (11 points) hit five straight points while North’s defense got five stops, including a turnover, to get within one at 21-20. After a timeout by the hosts, Attleboro rattled off 14 straight points to change the complexity of the game. Mason Houle (nine points, seven assists, four rebounds, two steals) started the run with a strong take to the basket, Qualeem Charles (six points, seven rebounds) added two more off a nice feed from Ciccio, Houle went coast-to-coast for two and then found Ciccio for a triple to make it 30-20 with two minutes to play. Attleboro forced a turnover and then was fouled going for the offensive rebound on a missed three. Keep possession resulted in two from Lorenzo Wilson (from Houle) and then Houle capped the run with a triple with under a minute to go to send the hosts into the locker room with a commanding 35-20 advantage. 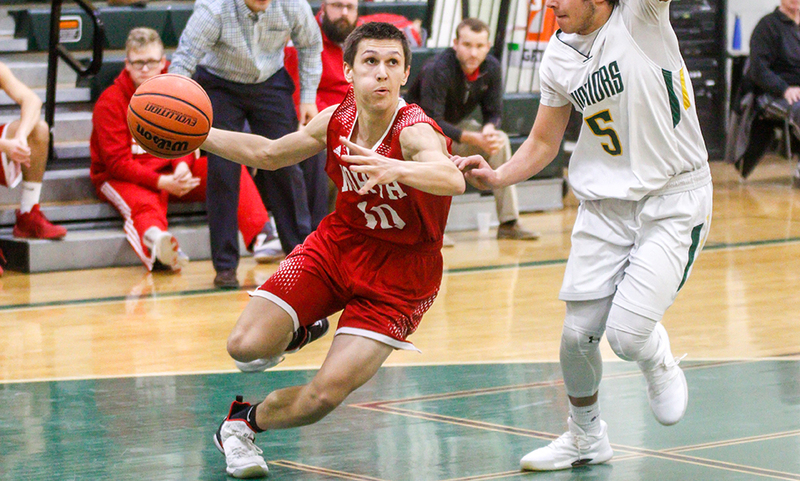 North Attleboro senior Nate Gonsavles (12 points, four rebounds) hit an early triple in the third quarter but Attleboro’s Kevin Velazquez (18 points) had his best frame of the season to keep the Bombardiers ahead. Velazquez opened the quarter with a layup and added two more after a near two-minute gap without scoring. Tim Callahan hit a three in the corner and Velazquez converted from deep after an offensive rebound from Ciccio. Gonsalves answered with a triple of his own but Velazquez game right back down the other end and sank a three-pointer to extend the lead to 48-26. “I think we’re starting to see that our shooting percentage is a lot better when we get so many touches per possession,” Houle said. “There’s a magic number that we want to get to and what I think that does is gets the defense moving and gets us open looks. I think for the second game in the row, we’re starting to build some consistency with it. When we didn’t do it, you saw turnovers. When we did, we got some good looks. I thought defensively [North Attleboro] did a nice job inside, we didn’t get a lot of looks inside tonight, but we were able to shoot the ball pretty well. After Gonsalves hit a floater, Velazquez came right back down and made his third straight triple to help the Bombardiers take a 53-32 lead into the final quarter. “Kevin had his best shooting game tonight,” Houle said of Velazquez, who went 4-for-8 from deep and shot 47% from the field overall. “We told him it would take a couple of weeks coming off a fall sport, just getting in a rhythm. He’s starting to come along and get his basketball legs back, which means he’s getting his shot back which is nice. Ciccio and Velazquez each connected on a three in the opening 90 seconds of the fourth quarter to effectively put any thoughts of a miraculous comeback away. Attleboro boys basketball (4-1 Hockomock, 6-2 overall) is back in action on Friday when they travel to King Philip. North Attleboro (2-3, 4-3) hits the road on the same night with a visit to Milford. NORTH ATTLEBORO, Mass. – In a game when points are at such a premium, even the smallest of runs can be game-changers. But in the last two minutes of the opening frame, Franklin’s offense came to life with an 8-0 run. Sophomore Chris Edgehill (eight points) drained a step back three and hit one of two free throws to start the run. Paul Rudolph scored in transition and Matt Elias converted an offensive rebound shortly before the buzzer to give the Panthers a 10-2 lead after one. Franklin kept that lead for the majority of the second quarter, leading 19-10 entering the final two minutes of the half. Edgehill got the run started again with a strong take to the rim, Jalen Samuels (nine points, nine rebounds) hit the first of two free throws and Elias drained a pair of threes inside the final minute, giving the Panthers a 28-10 lead at the break. While Franklin’s offense was able to create separation with those runs, North Attleboro never got into a groove. 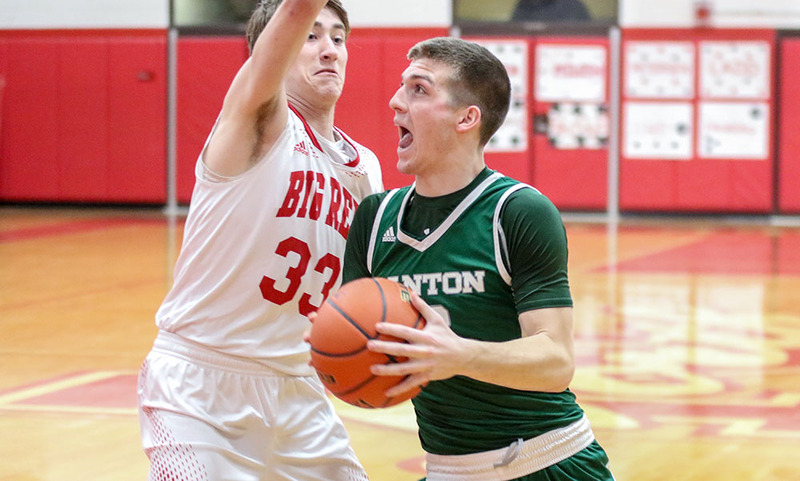 Big Red turned it over 10 times, partly due to the pressure of Franklin guard Paul Mahon, playing in his first game of the season. While North’s defense forced nine turnovers of its own, the offense shot just 24% from the field in the first half, including just a pair of two-point field goals. North Attleboro’s defense was just as strong in the second half, limiting the Panthers to under 10 points in each the third (nine points) and fourth (eight points) quarters. The Rocketeers held Franklin to 25% shooting from the field in the second half. 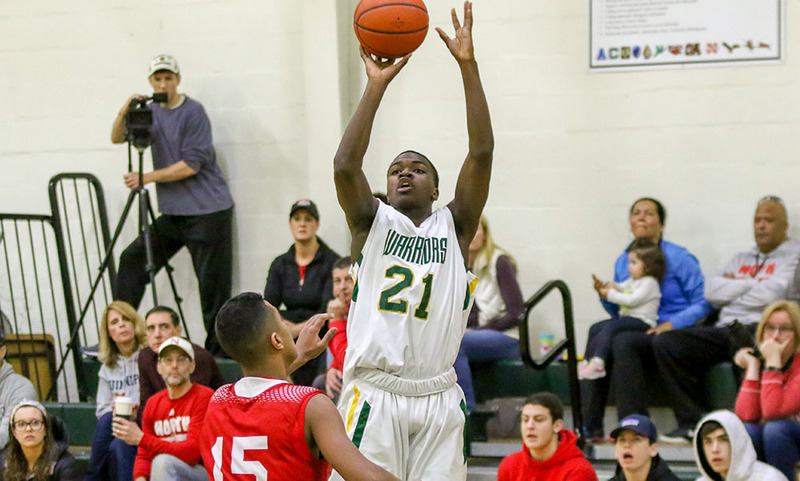 “[North Attleboro] did a great job defensively,” Neely said. “We’ve been struggling to score so far this season, and they were giving us some fits for a while. We were able to figure a couple things out and get some looks. But it was just one of those ugly games of basketball. We kind of like it, we’re not against it. But we wanted to be tougher after the Foxboro game. 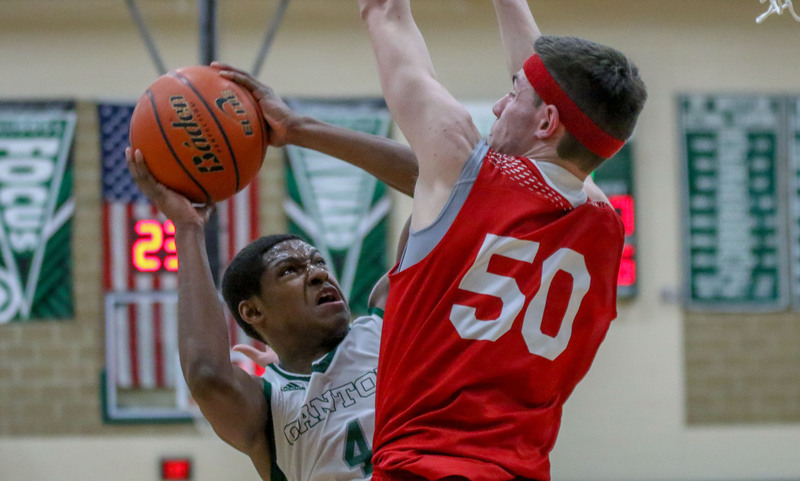 While North’s offense struggled, especially in the first half, the Rocketeers are hoping that it can build upon its strong defensive performance. North is just the fourth team since the beginning of last season to hold the Panthers to 45 or fewer points (Mansfield, Canton, Cambridge). 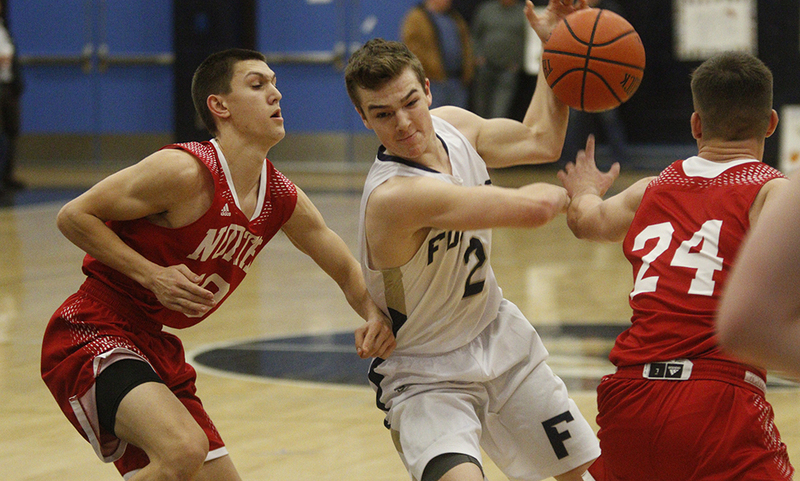 Franklin’s defense got a big boost on the defensive end with Mahon making his season debut. After missing the first two games of the season with an injury, the senior captain was back and made an immediate impact. While he will certainly have better offensive showings during the season, his presence on defense was felt immediately. North Attleboro junior Nate Gonsalves netted a career-high with 11 points to led the Rocketeers while classmate Josh Montague had six points and six rebounds. 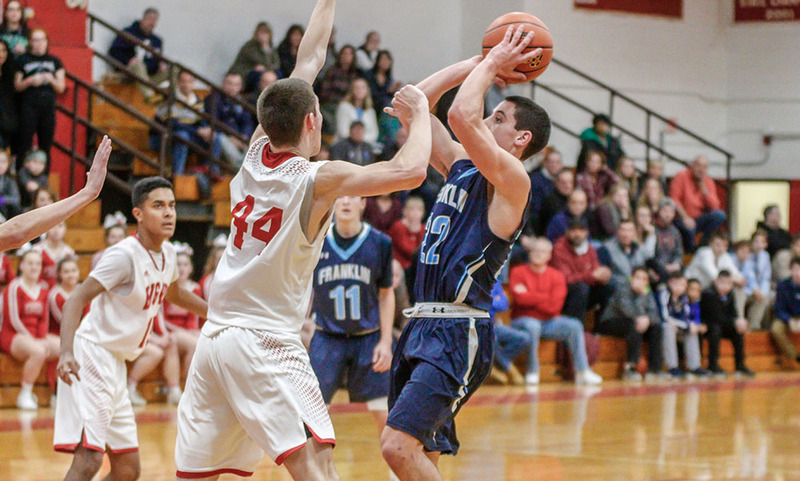 Franklin boys basketball (2-1 Hockomock, 2-1 overall) is back in action on Thursday when it heads to Somerville High for a tournament, starting off against Malden Catholic. North Attleboro (1-2, 1-2) will look to bounce back the same day at Lincoln-Sudbury’s tournament when it takes on Reading at 5:00.